Hard surface flooring stands up to the demands of a kitchen. Easy to clean. Handles spills easily. Many design options from which to choose. 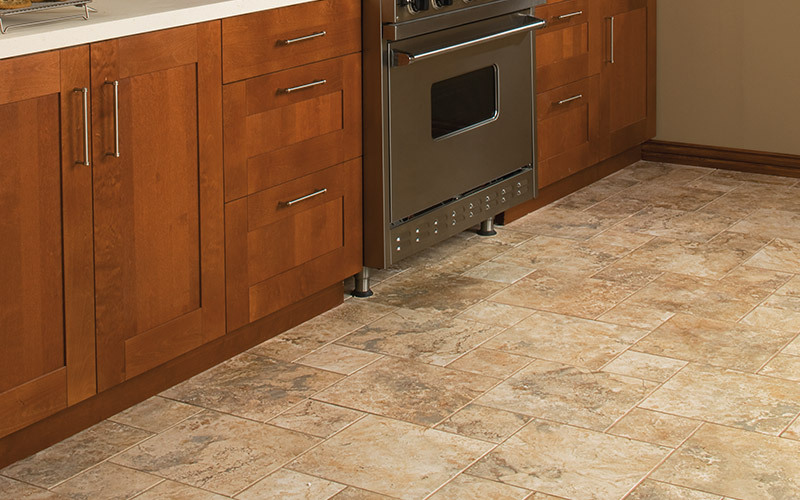 Ceramic tile, porcelain tile, luxury vinyl, hardwood, laminate wood... all of these are great choices for your kitchen. Current kitchen flooring trends have two of these floor types rising above the rest: luxury vinyl and waterproof composite flooring. Wood, stone, marble... all beautiful floor choices but expensive ones and choices that don’t do well in a kitchen where spills and water splashes happen frequently. Choose luxury vinyl or waterproof composite flooring and you can still have the look of these floors but with all the durability your kitchen requires. Luxury vinyl floors have been made to have all the easy maintenance, underfoot-comfort that you would expect to see in a vinyl floor. The resemblance to traditional vinyl flooring stops there. These floors look so much like hardwood or natural stone that you might have to get down on your hands and knees to tell the difference. You won't have a hard time telling the difference in your wallet or maintenance needs though. Bottom line, this is a fantastic floor choice for any kitchen. Waterproof composite flooring is a fairly new flooring category but one that is growing in popularity - and rightly so! This hard surface flooring has a highly authentic appearance of stone, ceramic or wood but is extremely durable, easy to clean and - as the name implies - 100% waterproof. Designed with a locking technology that keeps liquids from seeping into and below the floor, waterproof composite flooring lets you pick the look you want - even in your busy kitchen. Durable: an extremely hard, durable wear layer is added to the top of these flooring planks. Easy to clean: Sweep regularly. Wipe up spills when they happen. Damp mop occasionally with manufacturer recommended mild cleaning solution. Kermans Flooring has watched flooring trends come and go and we are excited about these new options for kitchen floors. Stop by our showroom in the Castleton area of Indianapolis to see for yourself!